When it comes to my little ones skin, I'm not up for taking risks, I want to use brands that I know and love, brands that I've road tested myself and that I know have the same kind to skin ethos that I hold. It's a hard pedestal to hold out for baby brands, there are so few that cater for adults too so it's rare that I can actually say 'Yes, I've used them, I know they're amazing'. Dove has been a household name for as long as I can remember, it's been around for sixty years now and so I was naturally delighted to see they finally brought out a baby range. I knew from the off we would have no problems, firstly, I do trust Dove - they've been in this game long enough to know what works. Babies need something that is gentle on their skin but incredibly nourishing too, when Noah was a newborn he was very overcooked so had the infamous dry skin that overdue babies are often born with, had Baby Dove been around then I would have so relieved as it's hard to find products suitable for newborns that aren't gimmicky and don't hold a sickly fruity scent. We chose to sample the sensitive moisture range as Patrick is still so little we just felt that something that bit softer on baby skin would be the way to go for us. First impressions are everything for me, I'm a sucker for packaging as you'll well know if you are a seasoned reader and I haven't been disappointed. I like neutral, classic designs which works well as it appears Baby Dove too, no garish packaging, just plain and simple which could slot into any show home bathroom with ease. On a side note, with two children my house bares absolutely no resemblance to a show home. An added bonus was the sizing of the products, quite often I've found that baby brands market their products for the home with separate options for travel sizes. 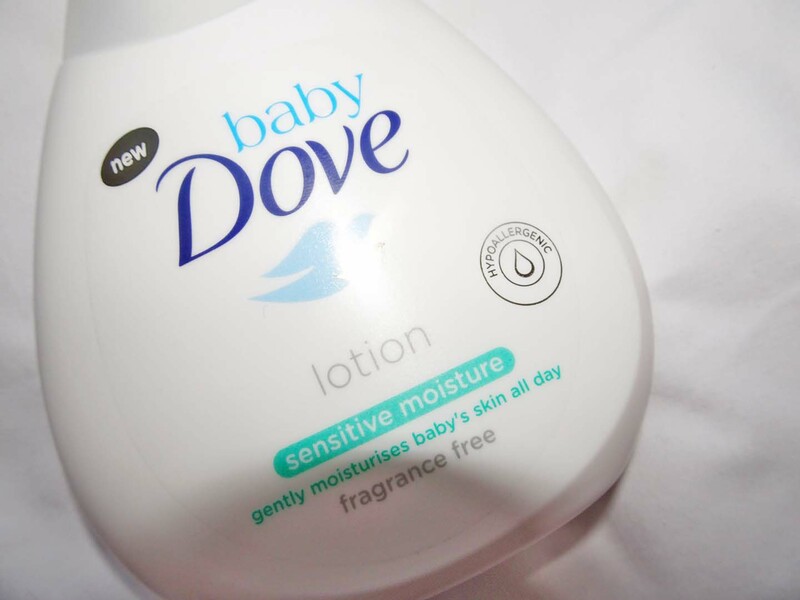 That's not how we roll, I don't want to have to purchase something twice and for the likes of a two week holiday abroad, a 100ml lotion isn't going to be enough, with Baby Dove I know I can easily slot that lotion into my luggage along with the other 101 things you need when holidaying with children. Now the products themselves, I'm going to start with the wipes as they are my favourite, in fact they're now our staple baby wipes to use. 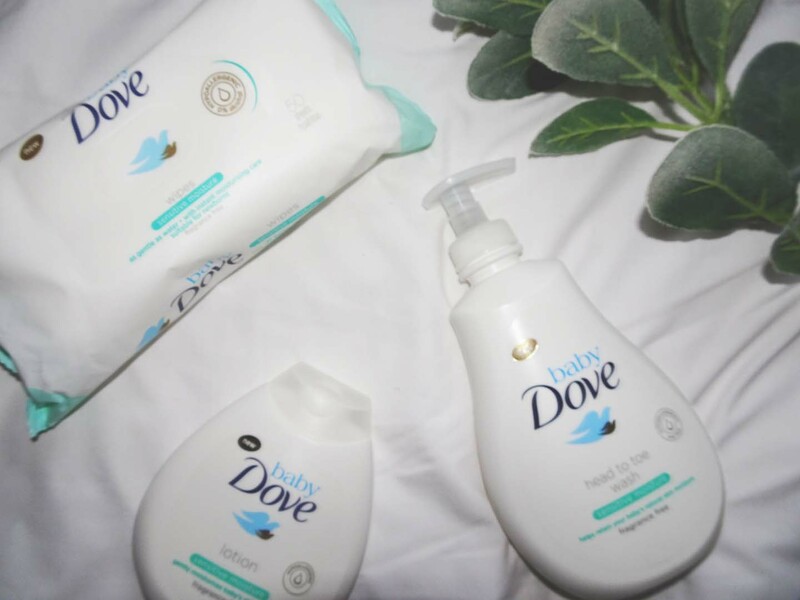 Before now, we were always a waterwipes kind of family, even though they were costly it felt justifiable given how much we loved them and how good they are for babies skin, however they've quite rapidly been replaced by Baby Dove - these wipes are insane. A bold statement you may think but I am incredibly fussy in the bum wiping department, being a nursery nurse I've tried and tested every single kind of baby wipe on the market, trust me. A wipe has to be strong and quite saturated for me, I don't want to waste ten wipes trying to clear up a stubborn poo-splosion, Like I say, these wipes have satisfied my needs and they're firmly in our basket every time we're doing a weekly shop at £1.50 a pack they're a bargain in comparison too. Though baby wipes are usually used in the nappy department, I like to have a package on hand for sticky fingers, crusty noses and yoghurt infused hair - that's why I'm so glad Dove really are extra sensitive to babies skin, Patrick has been using these for a good month now and we have nothing but positives to say. Onto the head-to-toe wash, I was sceptical as I am a sucker for that 'baby smell' and with this product being fragrance free I wasn't sure if we would love it - I was wrong. It's fantastic, it lathers really well so even using it with both boys, we need a minimal amount and I can see it lasting us a really long time. at less than £2 for a bottle can you ask for much more? It's suitable for newborns, hypoallergenic and can be used for those with eczema prone skin. Patrick was a poorly NICU baby, during which time he had photo therapy for jaundice, at ten weeks old he was unfortunate enough to catch chicken pox, so we know his skin has been through quite a lot in his short year so I'm pretty picky about what I'll put on it. Dove really have thought of it all with their range, I'm so glad they've decided to venture into baby products and can only hope that they'll be expanding onto other products, we've just snapped up their shampoo and to see a conditioner on the shelves would be fantastic. Have you tried Baby Dove before? *I have been sent this products for review purposes but all opinions are 100% honest. Sponsored post. I keep seeing this, will have to give them a try soon! Yes, yes and more yes and about bloody time too. I am so checking out and purchasing this, I think five is a brilliant brand. Didn't realise Dove had a baby brand, will have to look out for them, especially the wipes! Dove doesn't usually react well on my skin but will look out for these, haven't seen them in any stores yet! These look good. Wish they'd been around my my boys were tiny. I have already used a couple of these products and would highly recommend them to others! Really keen to try out this range with my youngest who has such sensitive skin!